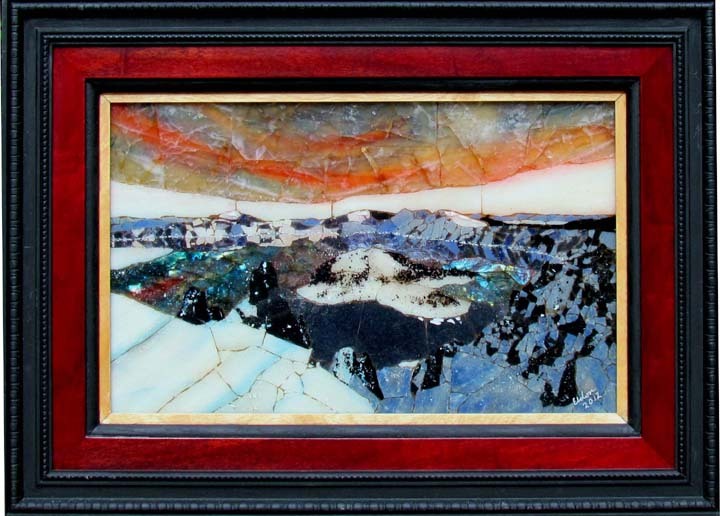 In this mosaic, I bring the viewer into the center of a calm winter scene created by Crater Lake and Wizard Island. The setting sun fills the sky with radiant colors. The sky is made of quartzes; there is some red and blue stain behind it. Along with the internal patterns in the rock, it creates a focal point that draws the viewer into the picture. The mountain in the background angles one direction and the reflection in the lake mirror that angle. Blue quartz illuminates the mountains while Labradorite set off the waters in the lake. This type of mineral radiates different colors at various viewing angles. The snow in the foreground is white alabaster. The frame is made out of Purple Heart wood to highlight the red color within the sky. In every mosaic rock picture I create, I try to incorporate something new.